Rotterdam-based architects MVRDV recently won the Gwanggyo City Centre Competition with their design of this incredible new city just south of Seoul, South Korea. Envisioned as a verdant acropolis of organic ‘hill’ structures, the proposed complex is a fully self-sufficient city for up to 77,000 inhabitants. Similar nodes, common in South Korea, concentrate residences, work and play all in one interactive center, reducing dependency on auto or train travel and building a strong sense of community. The concept is currently being reviewed for development and feasibility at Gyeonggi provincial authority’s Urban Innovation Corporation. Development is to be completed in 2011 and construction will start shortly after. "Development is to be completed in 2011 and construction will start shortly after" It's 2013, has any real progress been made on this? I can't find anything on the web, did this project just die? As Buckminster Fuller has stated. The most inefficient part of any city is that the pencil shaped sky scraper. It is the most inefficient for heating and transportation. This is a good concept on the wrong shape. If all the tall building were in a circle with the wide short building in the middle all connected by rings and spokes lets say it would be more functional. Rotterdam-based architects MVRDV recently won the Gwanggyo City Centre Competition with their design of this incredible new city just south of Seoul, South Korea. 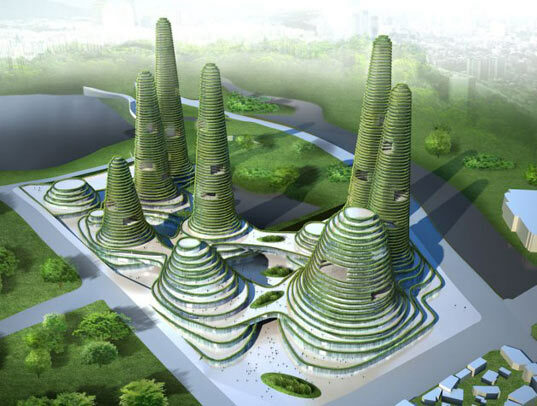 Envisioned as a verdant acropolis of organic 'hill' structures, the proposed complex is a fully self-sufficient city for up to 77,000 inhabitants. Similar nodes, common in South Korea, concentrate residences, work and play all in one interactive center, reducing dependency on auto or train travel and building a strong sense of community.